Back in 60s and 70s, many prominent scientists believed that saturated fat was the main cause of heart disease, by raising the “bad” cholesterol in the blood. However, there wasn’t a single study on this diet at the time. The American public became participants in the largest uncontrolled experiment in history. The diabetes epidemic followed soon after. Of course, a graph like this doesn’t prove anything. Correlation does not equal causation. But it doesn’t end there, unfortunately… the low-fat diet recommended by most nutrition organizations is not only ineffective, it may even be downright harmful. Nutrition professionals have had remarkable success with demonizing perfectly healthy foods. Probably the worst example of that is eggs, which are among the healthiest foods on the planet. Just think about it… the nutrients in an egg are enough to turn a single fertilized cell into an entire baby chicken. Even so… because eggs contain large amounts of cholesterol, they were believed to cause heart disease. However, studies actually show that the cholesterol in the diet does NOT raise the bad cholesterol in the blood. Eggs raise HDL (the good) cholesterol and are not associated with an increased risk of heart disease (14, 15, 16, 17, 18). What we’re left with is an incredibly healthy food… loaded with vitamins, minerals and powerful nutrients that are important for the eyes and brain (19, 20, 21). Keep in mind that almost all the nutrients are found in the yolk… the white is nothing but protein. Telling people to ditch the yolks may be just be the most ridiculous nutrition advice in history. Bottom Line: Eggs were demonized because of the high amount of cholesterol, but new studies show that they don’t raise cholesterol in the blood or contribute to heart disease. Eggs are among the most nutritious foods on the planet. Probably the biggest mistake in modern medicine is focusing too much on Total and LDL cholesterol levels as indicators of heart attack risk. Well… it is true that elevated levels of both are associated with increased risk (22). But the whole picture is much more complicated than that. Total cholesterol actually includes lots of things… including HDL, also known as the “good” cholesterol. Having high HDL actually raises your Total cholesterol number. LDL cholesterol isn’t just LDL either… there are subtypes. We have the small, dense LDL particles (very bad) and then we have the large, fluffy LDL (good). The small particles are associated with heart disease, while the large ones are mostly benign (23, 24, 25, 26, 27). Not to mention that cholesterol levels that are too low are actually associated with increased risk of death… from other causes, like cancer and suicide (33, 34). Despite the weak predictive value of Total and LDL cholesterol, people with elevated numbers are often instructed to lower cholesterol by any means necessary… including a low-fat diet (which doesn’t work) and statin drugs. For some very strange reason, processed seed- and vegetable oils became recognized as health foods. Humans only started consuming them about a 100 years ago, because we didn’t have the technology to process them until then. Yet, somehow the nutrition geniuses figured that these would somehow be very healthy for humans and certainly better than the “dangerous” saturated fats. However… these oils are actually recommended by the beloved organizations that are supposed to be in charge of protecting our health. This is one example of where blindly following the conventional nutritional wisdom can put you in an early grave. 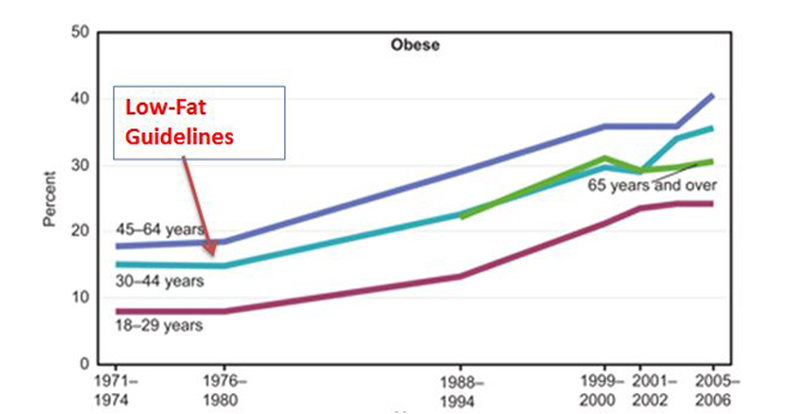 The “war on saturated fat” has been a miserable failure. It was initially based on flawed studies, but somehow became public policy (with disastrous consequences). The worst part is… the governments and health organizations have yet to change their position despite overwhelming evidence that they’ve been wrong all along. Actually, saturated fat doesn’t really raise LDL that much. The effect is weak and inconsistent and appears to depend on the individual (43, 44, 45). Many other studies confirm these findings. Saturated fat is harmless (52, 53). The truth is… saturated fat never has been and never will be proven to cause heart disease, because it simply isn’t true. The manufacturing process is very disgusting… involving high pressure, high heat, a metal catalyst and hydrogen gas. The fact that anyone thought these nasty fats would be suitable for human consumption is baffling. Some of the major health organizations have started to confuse people by grouping trans fats together with saturated fats, calling them the “bad fats” (54). However… like I outlined above, saturated fat is completely harmless, but the same can NOT be said for trans fats. Trans fats are highly toxic and can cause insulin resistance, inflammation and significantly raise the risk of serious diseases like heart disease (55, 56, 57, 58). Even though consumption has gone down, trans fats are still found in processed foods and the FDA still categorizes them as “Generally Regarded as Safe” (GRAS). 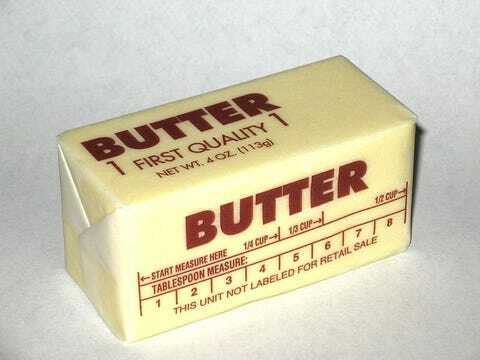 If you want to avoid chronic disease… then eat your butter, meat and coconut oil, but avoid trans fats as if your life depended on it (it does). Fat is the stuff that lodges under our skin and makes us look soft and puffy. Therefore, eating more fat should make us store more of it. You are what you eat, right? Well, it actually isn’t that simple. Low-carb, high-fat diets also lead to all sorts of other benefits… increased HDL cholesterol, lower triglycerides, lower blood sugar and insulin levels, more abdominal fat loss and improved size of LDL particles (62, 63, 63, 65). Many other studies have looked at high-fat dairy products and found no evidence that they contribute to any disease… in fact, high fat dairy is associated with a lower risk of obesity (67, 68). Because of the ridiculous low-fat advice, food manufacturers removed the fat from some of their foods. But there was a major problem… natural foods taste terrible without the fat. The food manufacturers realized this and added a whole bunch of sugar to compensate for the missing fat. For this reason, most “low fat” foods are actually loaded with sugar, which is seriously harmful (69, 70, 71). If a food has “low fat”or “diet” on the label, then you will probably find sugar, corn syrup and various artificial chemicals on the ingredients list. However, sales of these foods have skyrocketed because many nutrition professionals still advise people to eat them… even though the “normal fat” alternatives are much healthier!